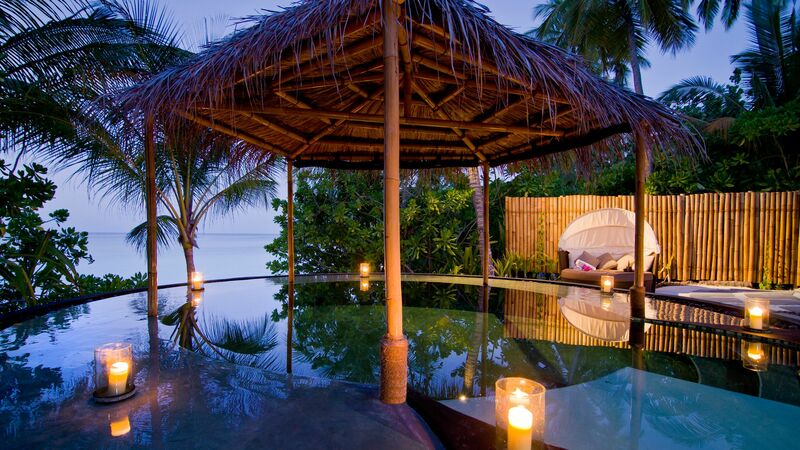 The One&Only Reethi Rah resort is set on the powdery white sands of the beach and offers the ultimate in luxury holidays in the Maldives. This paradise resort offers guests activities and amenities for every moment, as well as opportunities to simply relax and enjoy a well deserved break. Each of the villas is bright, modern and spacious, allowing you to choose from villas set right over the water or with direct access to the beach. Outdoor rain showers, a king size bed or two queen size beds offer a comfortable stay, while you can also dine al fresco on your private terrace. Activities include sailing, picnics on a private island and snorkelling and scuba diving are a must. Child prices apply to ages 0 – 11 years. The hotel has 120 villas and 2 residences. 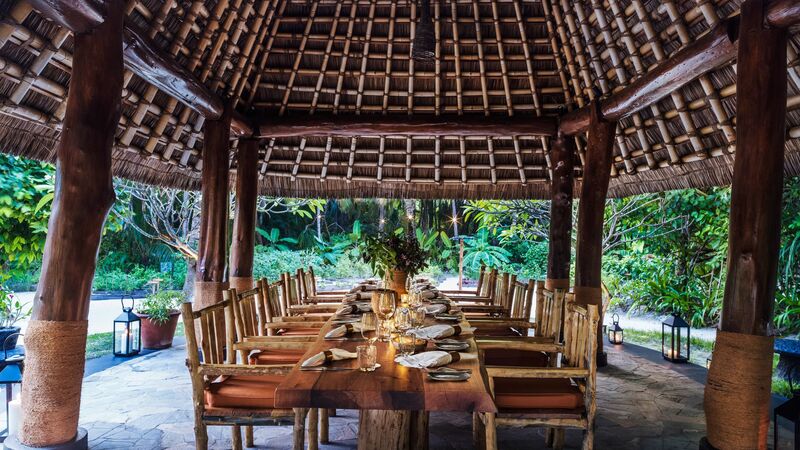 Surrounded by ancient trees and exotic flowers, this rustic restaurant offers delicious healthy dishes created using natural ingredients with local and international options. 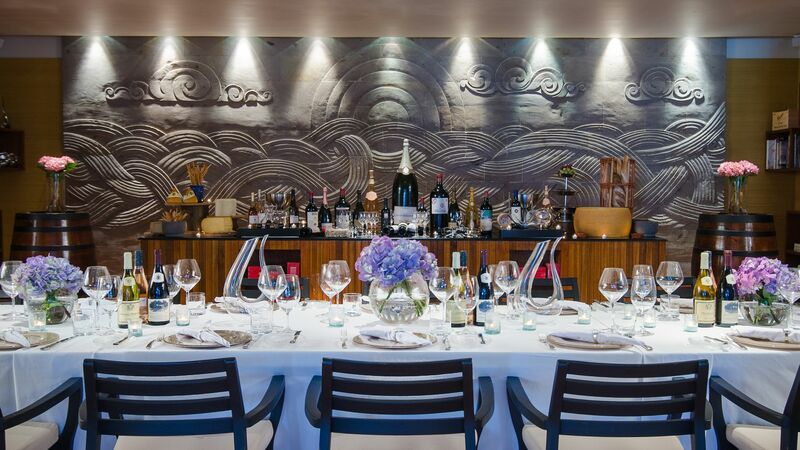 This opulent restaurant is decorated with influences from earth, fire and the ocean. Menus are created by expert chefs and include modern fusions of French, Asian and Italian cuisine. Take in views of the Indian Ocean as you dine on this luxury open wooden deck. Celebrated chefs have created an innovative menu of contemporary Japanese dishes, including sea bass and char grilled wagyu steak. Dine by the sea in pretty cabanas as you explore Middle Eastern flavours and mezzes from Syria, Morocco, Lebanon and more. This relaxed al fresco restaurant has an open kitchen and bar with a wood fired oven where you can enjoy delicious pizzas, salads, pastas and more. 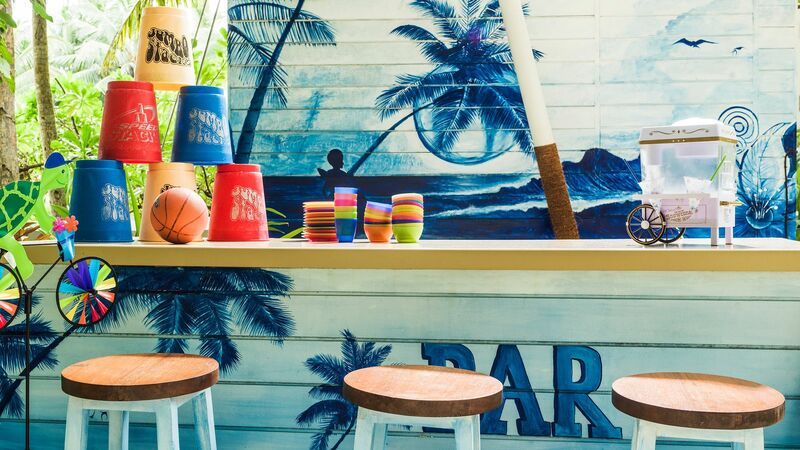 This relaxed beach club is the ideal place for refreshing snacks, light meals and drinks. Listen to chilled out tunes and enjoy Latin American dishes, including tacos and fresh seafood. Dine on fresh light meals in this exotic bar and enjoy cool music, cocktails, fine wines, champagnes and more. Innovative dishes include tuna, lobster and beef cooked on Himalayan Salt Bricks. This rustic bar has its own wine cellar filled with a selection of over 500 wines from around the world. Expert sommeliers will take you on a journey through Bordeaux, California, South Africa, Australia, Tuscany and more. 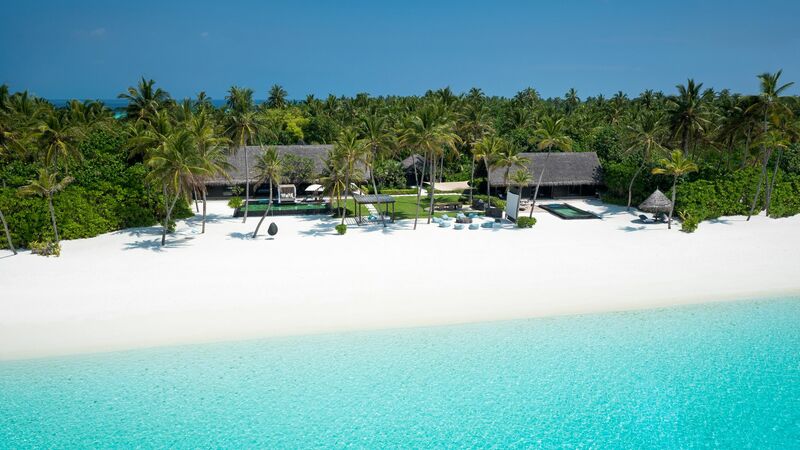 One&Only Reethi Rah is set on the white sands of the Indian Ocean where you can spend lazy days soaking up the sun and relaxing. Many of the villas come with their own private pools, and there is also a large freshwater swimming pool for everyone to enjoy. Fun and games are run by experts throughout the day and include arts and crafts, swimming, cooking, treasure hunts and fashion shows. Younger guests can spend the day making new friends and trying the many activities on offer. They can learn to sail, snorkel, swim and even enjoy a mini disco and movie evenings. 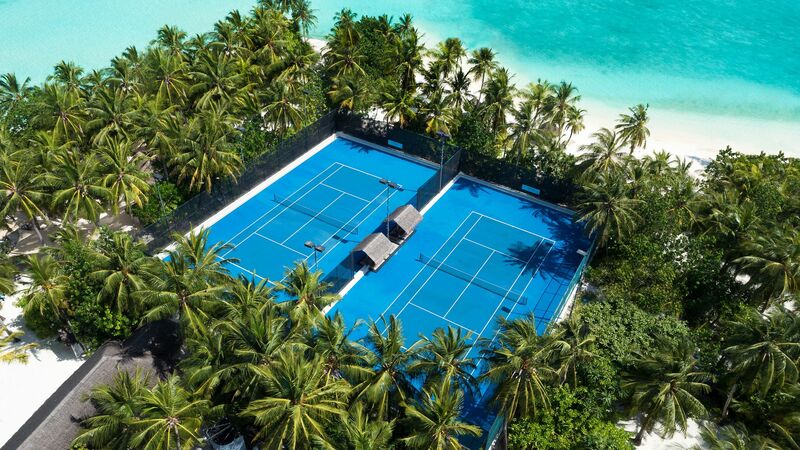 Teens can keep active at the One&Only Reethi Rah, as well as making friends their own age. Activities include pottery and pizza making, as well as movie evenings and more. Immerse yourself in the stunning surroundings of the hotel’s spa as you enjoy a range of treatments at the hands of the expert staff. Massages and facials are on offer, as well as signature experiences designed with your needs in mind and combining Eastern and Western philosophies. The hotel’s onsite gym is fully air conditioned and overlooks the pretty gardens. Fitness lessons and personal training sessions are also on offer. 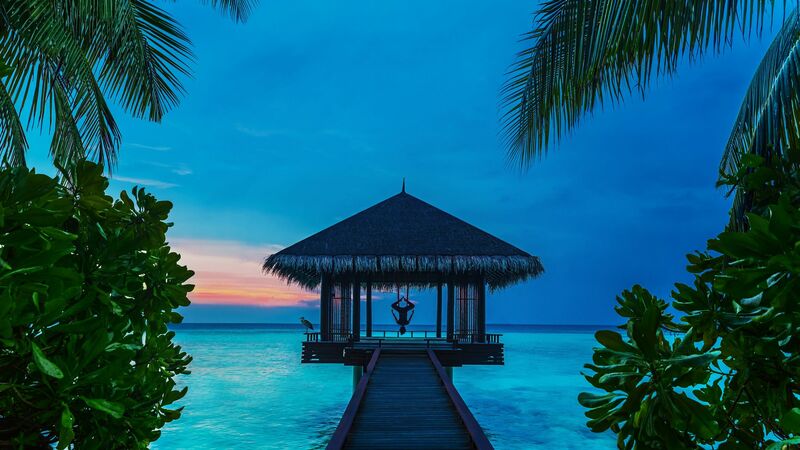 Group and personal yoga and meditation sessions are run by experts in the hotel’s pavilion, which offers panoramic views of the Indian Ocean. Tai Chi and Pilates classes are also available. 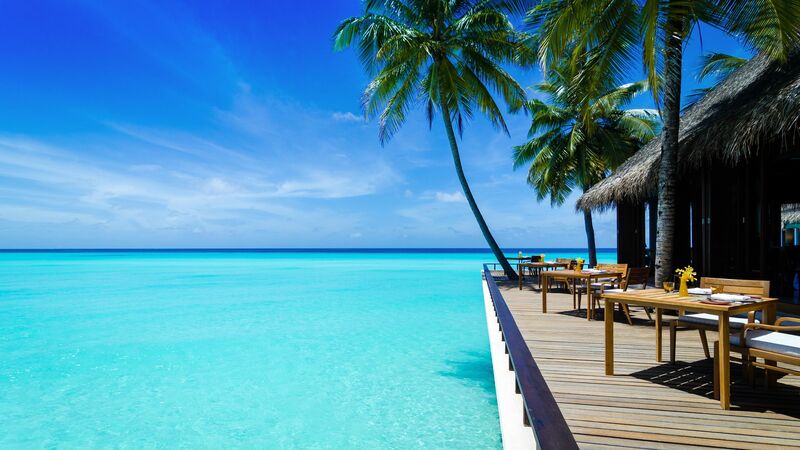 The Maldives is known for its vibrant coral reefs which are teeming with thousands of species of fish. Snorkel or scuba dive straight from the hotel or take day trips to nearby sites. Take a seaplane and enjoy the stunning birds’ eye views, charter a luxury yacht or allow an expert crew to do all the hard work for you. Swim with whale sharks, go fishing or picnic on your own deserted private island. Those wanting to pick up souvenirs, local handicrafts, designer items and jewellery can enjoy browsing in the hotel’s three onsite boutiques. 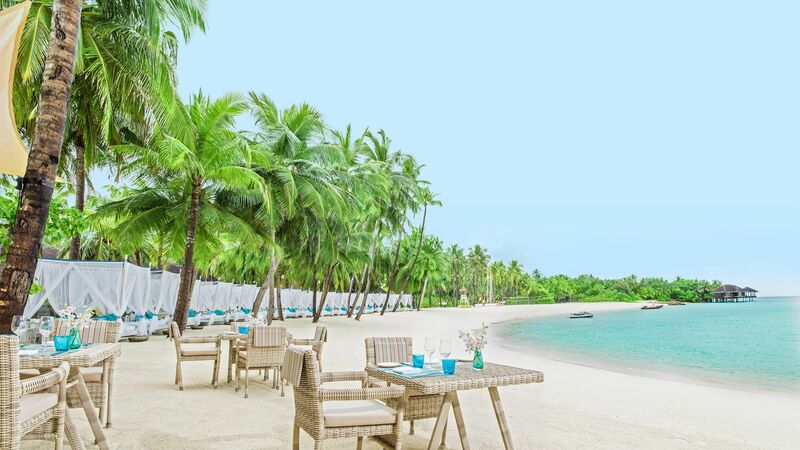 Located on one of the largest islands in North Malé, in the idyllic Maldives, One & Only Reethi Rah is the ideal resort for beach lovers, couples and families. Spend your days soaking up the sun on the white sandy beaches which fringe the Indian Ocean, as well as taking excursions through the surrounding area. Surrounded by coral and lagoons, spend days exploring the underwater world with scuba diving and snorkelling excursions or simply set off straight from the hotel. Take a seaplane and enjoy a bird’s eye view of the clear waters and white sandy islands, or try fishing and yacht charter. You can also dive with whale sharks as well as being dropped off on your own deserted island for a day of relaxing under the palm trees and enjoying a delicious picnic. 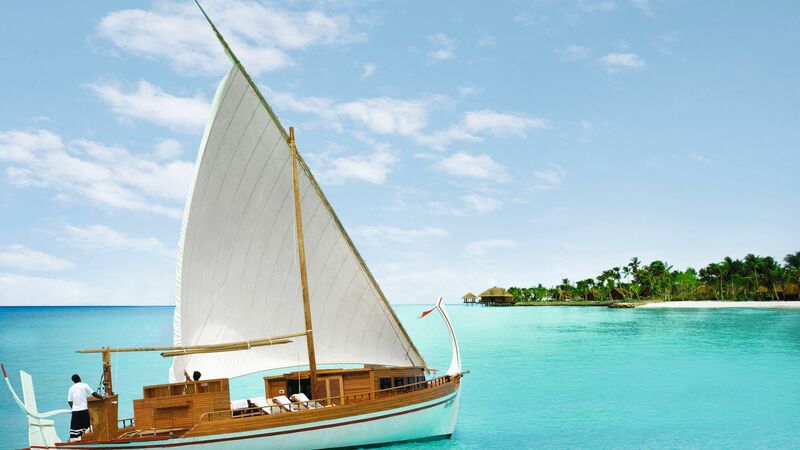 The One&Only Reethi Rah is a 30 minute seaplane flight from Malé International Airport. 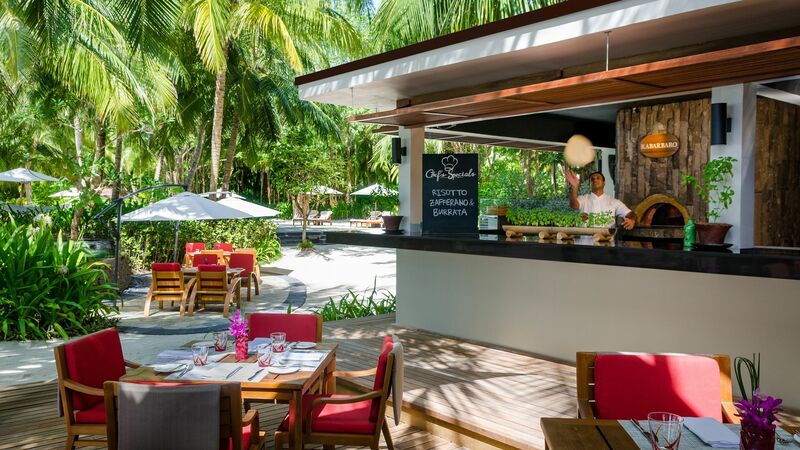 Open the large French windows which lead out onto your private wooden deck where you can enjoy al fresco dining overlooking the white sandy beach and sparkling Indian Ocean. Choose from a king size bed or two queen size beds and enjoy the bright, airy and rustic interiors. There is also an outdoor shower and an en suite with an indoor shower and bath. These large rustic villas are located on the water and stand on stilts. Listen to the gentle lapping of the waves from beneath your luxury room or private wooden deck. Large windows offer panoramic views of the Indian Ocean from every room and there is also a luxurious en suite with a separate bath and shower. 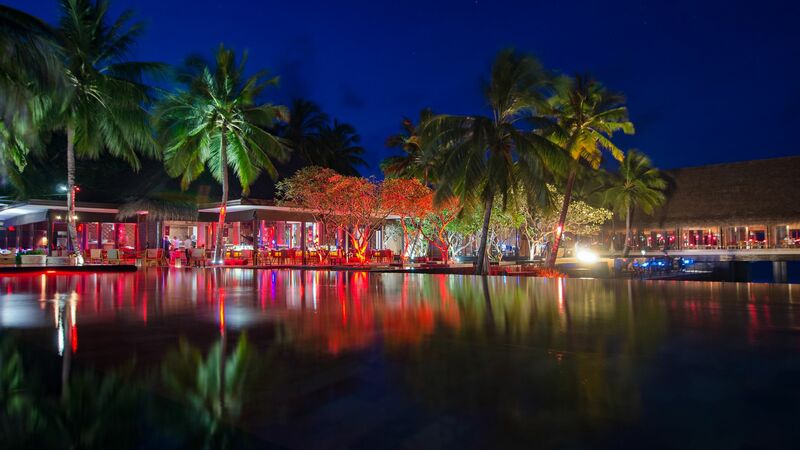 Blending modern luxury with rustic designs, this large villa has large windows in every room, offering views of the white sands of the beach and sparkling Indian Ocean on one side and the luscious hotel gardens on the other. Your private terrace contains a swimming pool and there is also an outdoor shower as well as an en suite with a separate bath and shower. 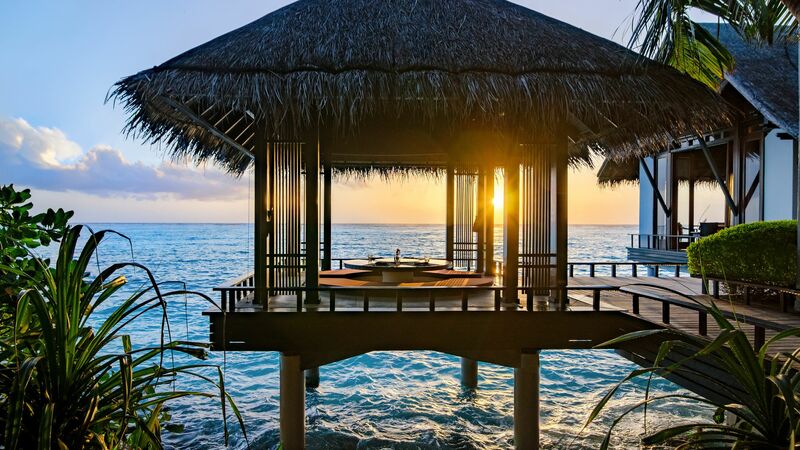 Accessed by a wooden walkway and surrounded by the Indian Ocean, this rustic water villa is built on stilts and offers a romantic, secluded location. Listen to the sounds of the ocean beneath your villa and enjoy a luxury deck area with a private pool and split level sun terraces. Sleep in a hammock or on your king size bed and enjoy spectacular interiors and an en suite with a separate bath and shower. 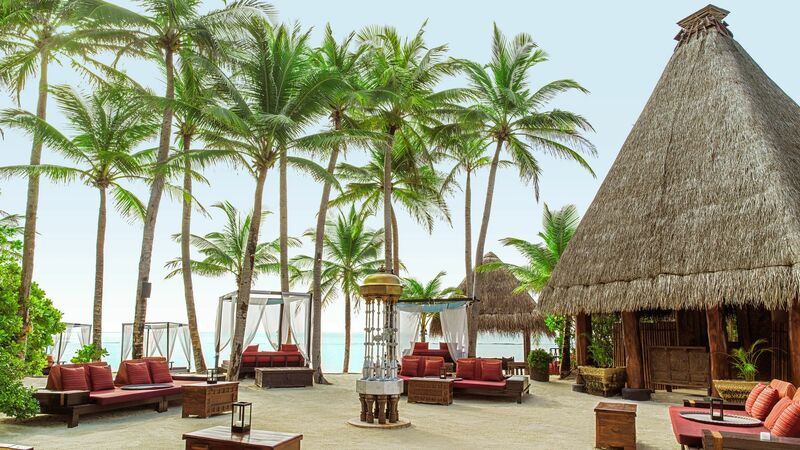 This rustic, elegant and luxurious residence offers two beach villas a few steps apart with spectacular views of the soft white sands and sparkling waters and is surrounded by the exotic hotel gardens. A private pool, terrace and section of the beach are the perfect place to relax and there is also an outdoor rain shower with an al fresco dining area. The interiors feature a seating and dining area, rustic details, large windows, a king size bed, twin beds and an en suite with a separate bath and shower. You can also enjoy your own golf cart to get around the resort. 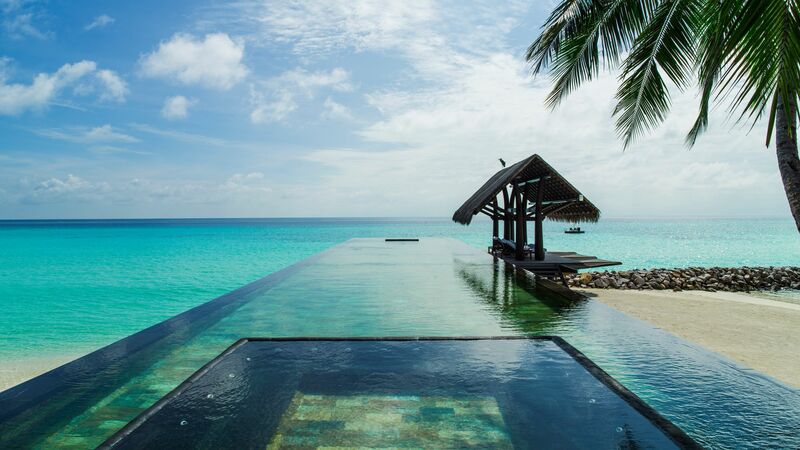 Surrounded by its own private decking and the crystal clear waters of the Indian Ocean, this grand villa is set on stilts and can be accessed via its own wooden walkway. Your private infinity pool and multi-level sun terrace is the perfect place to unwind as you look over the seemingly endless blues of the sea. There is also a separate outdoor jacuzzi. Inside you’ll find beautiful interiors, a dining and living area and an en suite with a separate bath and shower and luxury amenities. Floor length windows open out onto your private terrace which leads down to the white sands of the beach and the crystal clear Indian Ocean. Outside you can enjoy your own private swimming pool and lounge area, as well as an al fresco dining table. There is an outdoor rain shower, as well as an en suite with a separate bath and shower. Inside you can enjoy rustic, luxurious interiors, a seating and dining area and a king size bed as well as twin beds. The villa also has a golf cart to use around the resort. WOW!!! What a resort!! From the moment we arrived to the moment we left its was an absolute pleasure to visit this beautiful island. Friendly staff, great restaurants, great beaches, amazing accommodation!! A truly wonderful place, can't wait to go back. The resort was so beautiful.. high in standard..so many activities to do during the day.. so many choices whether it’s for the kids or grownups. They had a Mexican chef who came for Easter his food was so good. A family of three that I work for recently spent a week at this location. The reviews below are from the two children. 12 year old boy: There was a variety of activities to do on the island. The staff was extremely nice. There were so many small commodities that make a big difference, like having bikes and buggies available. These make what's already good even better. The villa itself is the perfect size. It's not too big or too small. It was perfect for us. Outside of the villa, it was amazing being able to jump straight into the water. It's freeing. And there was a beach close by, plus bikes right outside to help us travel around. The beach club was super cool with the ice cream stand. It was so nice to be able to order food and drinks and use the jet skis and sea bubs and go waterskiing and have extra water activities available, too. There was also a floating play area in the ocean. The beach was super clean and huge. 9 year old girl: The food was delicious, especially the Italian and Japanese foods. The interior of everything was obviously carefully designed and all the extra details really showed. There were so many activities available, especially for us kids to play with. Improvements to suggest: Thai and Chinese foods could have been better. Wish there were more options of floaties for kids to use in the ocean. One of the place to visit unless once in the life. Thank you for your service,we had an amazing vacation! The restaurants were always ready to satisfy our request, the management team so welcoming. Thanks!